As the inauguration of Donald Trump approaches, we enter a historically extraordinary period in which a single political party controls the House, the Senate and the White House. “Control” should be taken with a grain of salt, because little is absolute in our nation’s capital. While absolute control doesn’t happen in Washington, the political arena does have constants. During the past several years, a great constant has been the confrontation between opposing perspectives. Under the new administration, that confrontation focuses on the struggle over the separation of power written into the U.S. Constitution. The incoming political majorities seem determined to reduce the power of the executive branch of government, meaning to constrain the president’s ability to use executive orders and the authority of administrative offices to write and enforce regulations based on legislation. The lobbyists are out in great numbers, speaking on behalf of either public or private interests. This section also contains objectives to reduce or roll back federal regulation of (a) drugs, medical devices, and treatments, especially the new and experimental, (b) tobacco substitutes, (c) soft and pliable plastics (phthalates), (d) flame retardants (organohalogens), (e) online gambling, and (f) sports gambling. Finally, this section recommends federal defunding of “activist research,” such as research on the safety hazards of BPA (bisphenol a) lining of metal food containers. These are industry-sponsored objectives, not actual legislation. Their basic message is expressed in the report’s title, which translates to Make Money. At the same time, consumer groups are vigorously organizing their defense of regulations that are intended to protect public health and safety. In California, the governor and attorney general are prepared to resist federal actions that would obstruct the state’s progress on several important issues. The debate over the appropriate balance between public and private interests will continue during the coming four years, with an opportunity at the mid-point of this period to review the actions of some of our elected representatives. Meanwhile, the political environment must be regarded as unsettled at best. Experienced gardeners know that the early fall is a very good time to install new plants. This timing anticipates our Mediterranean climate’s rainy season, during which Nature provides the moisture that new plants require, and the winter months allow time for them to establish their roots in preparation for above-ground growth in the spring. It is quite natural in this season for gardeners to plant with spring flowers in mind, with their greatest interest focused on spring bulbs. There’s nothing wrong with that approach, especially when gardeners explore the lesser-known geophytes, as well as the always popular spring- and summer-blooming bulbs. Still, this season is the ideal time to plan for next year’s fall season. This planning begins with a critical look at your own garden. Is it visually exciting and beautiful during the next few weeks, or does it appear tired and eager to enter dormancy? If it could be more pleasing to the eye, plant now to ensure a better look a year in the future. An easy and reliable way to find plants to add fall color to your next-year garden is to take a walk through your neighborhood to spot attractive plants that look healthy and vigorous. By scanning gardens with growing conditions like yours, this approach automatically directs your attention to plants that are likely to do well in your garden. Another productive strategy is to ask at your favorite garden center about plants for fall color. A trustworthy garden center will be ready to point out such plants and recommend winners for your garden setting. Research also can identify good candidates. The Sunset Western Garden Book lists several trees, shrubs, and vines for fall color, and provides details for each in its Western Plant Encyclopedia. Here are a few popular selections. Pacific Dogwood (Cornus nattallii) A spectacular tree that can grow to 50 feet tall. It flowers white or pink in the spring and again in the summer> In the fall it displays yellow, red and pink leaves and clusters of decorative red fruit. Maidenhair Tree (Ginkgo biloba ‘Autumn Gold’) An ancient, actually prehistoric genus that can reach 30 feet tall. It produces gold-colored leaves that drop quickly in the fall to produce a golden carpet. Flowering Crabapple (Malus hybrids) Small trees (usually 20 feet tall) that flower in the spring then hold their attractive fruit through the fall. Many varieties are listed in the Western Garden Book. Cotoneaster varieties (e.g., C. lacteus, C. franchetii) This shrub, native to China, comes in various sizes from groundcover to twenty feet tall and wide. Produces bright red berries in the late summer followed by fall. Windflower (Anemone x bybrida) The popular Japanese Anemone (A. japonica) produces white, pink, or rose flowers on arching stems up to four feet high, followed by unusual cottony seed heads. Aster (Aster x Frikartii ‘Monch; Symphyotrichum spp.). Only the European and Asiatic species are still called Aster officially; North American species have that long new name. Hundreds of varieties are available to produce an abundance of flowers from white to pale blues and pinks to deep scarlet and purple. Chinese Wisteria (W. sinensis). This vine, the most common wisteria in the west, produces clusters of violet-blue, slightly fragrant flowers that open all at once in the fall. Roger’s California Grape (Vitis californica cultivar ‘Roger’s Red’) A central California native often grown as an ornamental plant grows so vigorously that gardeners can boast of their green thumbs. Many American and European varieties are available for table grapes. There are many more plants that can beautify your garden environment in the fall with colorful flowers, foliage or fruits. Plan and plant now, as we enter the planting season, to set the stage for attractive seasonal displays in future years. A current project in my garden involves relocating a specimen plant to a more prominent site, to take advantage of its current and anticipated appearance. The plant is Giant Cabuya, a member of the Agave family (Agavaceae). In English, Cabuya means Agave, but it might also mean fibre. The plant’s botanical name is Furcraea foetida ‘Mediopicta’. Native to the Caribbean area and northern South America, this succulent plant is widely grown as its variegated leaves can create a five-foot wide display and a spectacular presence in the landscape. I put the Giant Cabuya in a large terra cotta pot, where it grew well for more than a year, and spread about three feet wide. I learned that it would reach its maximal spread only when grown in the ground. I had recently renovated an overgrown cluster of Peruvian Lilies, and reshaped the planting bed into a roughly circular form. The new bed, currently without plants, needed redesigning, with a focal point. A dramatic sculpture would be appropriate but not in the budget, so a large plant with architectural character could serve as the purpose of a focal point. This was to be the new home for the Giant Cabuya. The bed was large enough for the plant to grow to five feet wide, and eventually to throw up its malodorous flower stalk. A short list of plants can be useful as focal points in the landscape. Large succulent plants, particularly those in the Agave family, have good qualities for this purpose. This is a matter of individual preference of course, but long, sturdy leaves can form a roughly symmetrical display that is readily perceived as sculptural. For an interesting overview of architectural agaves, visit the website of succulent expert Debra Lee Baldwin, navigate to Videos and look for “Six Great Agaves for Your Garden.” In this video recording, renowned agave hybridizer Kelly Griffin casually demonstrates agaves that would work well as focal points in the garden. 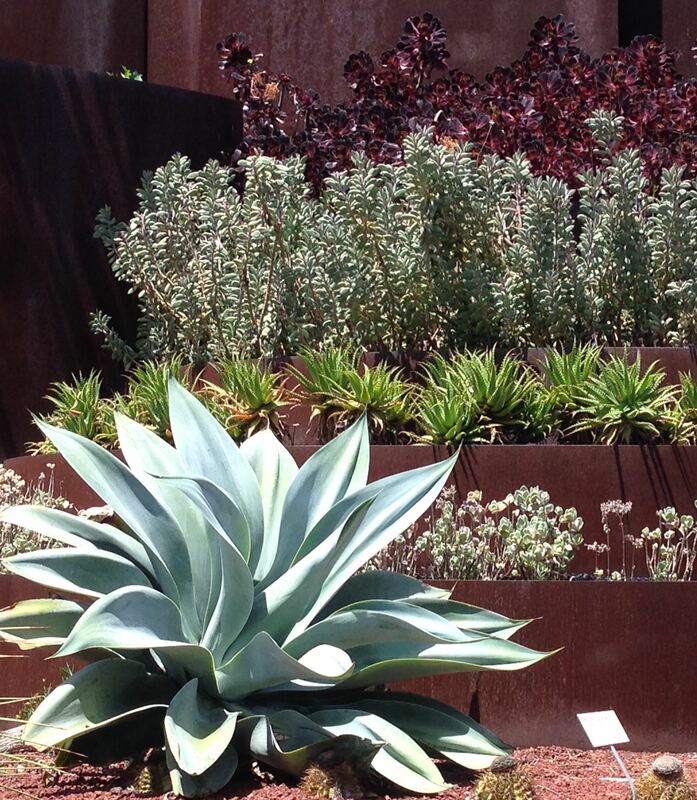 In addition to the larger agaves, several other plants have architectural value. If your garden could benefit from an eye-catching, prominently placed plant, look for candidates when you visit your local garden center. A dramatic feature could add interest to your landscape. This has been a really good year for rose blossoms. Gardeners who have roses in their landscapes have enjoyed excellent displays that might have resulted from the combination of drought conditions followed by timely rains. Perhaps botanists and meteorologists will collaborate to track the progression of weather effects and rose blooms. The notorious “some people” have announced that the challenges of rose cultivation exceed the value of these plants in the garden, but there are still plenty of dedicated fanciers of the rose and public rose gardens to defend the genus. The vigor of the American Rose Society demonstrates the continuing appeal of roses. Hybrid tea roses are enduring favorites for most rose lovers, but value can come from comparing examples of different species. For example, compare rebloomers, mostly modern roses, with once-bloomers, many of which are ancient roses, e.g., Gallica, Damask, Alba, Centifolia, Moss, China, Portland, Bourbon and Hybrid Perpetual Roses. Numerous roses bring seasonal color to my garden. Most are hybrid teas, including several David Austin roses. My favorite among these is ‘Graham Thomas’, a yellow classic climbing rose, selected by and named after the English rosarian and author of several books on roses. This vigorous repeat bloomer occupies a prominent spot next to my house. Another favorite is ‘Dortmund’, which is a highly rated climber that produces dark, glossy foliage and clusters of single, white-eyed, red flowers, borne freely from summer to autumn. This plant grows on a gate under a very large pittosporum; the rose does well but surely would do better in full sun. Among my once-bloomers is Rosa mulligani, one of the largest climbing/rambling species that was the center of Vita Sackville-West’s iconic white garden at Sissinghurst Castle, in England. This rose, growing on my backyard fence, produces a cloud of white blossoms, with branches reaching up to twenty feet to the left and to the right. 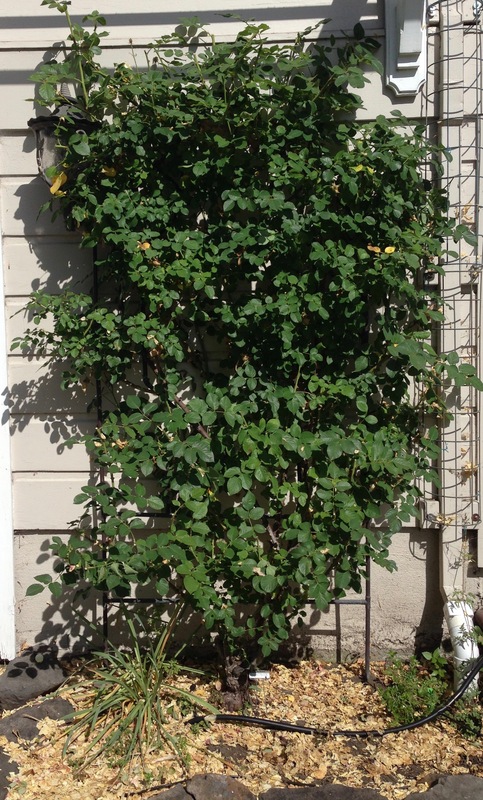 Roses, like apples, produce blossoms and fruit best on horizontal branches, so this is fine placement for any climber. It is now time to deadhead the repeat bloomers, to stimulate the development of a second flush of blooms. This should be done soon after the blossoms fade, to maximize the time for new growth and, incidentally, to deny nesting opportunities for certain insects, e.g., earwigs, sow bugs, thrips. Deadheading generally is done just above the first set of five leaves. It could be done lower on the stem, to the second five-leaf set, or even to a seven-leaf set, when the plant needs shaping. After all the blooms are spent, leave the plant to develop rose hips for winter display. Once-bloomers need not be deadheaded as soon as blooms fade because that won’t produce additional blooms. Deadheading once-bloomers in late June, however, will maximize the time the plant has to produce many new buds for the next season. If you like to see colorful rose hips in the garden, leave the once-bloomers on their own through to late winter. Deadheading your roses now is a timely investment for a rewarding yield in the next season. 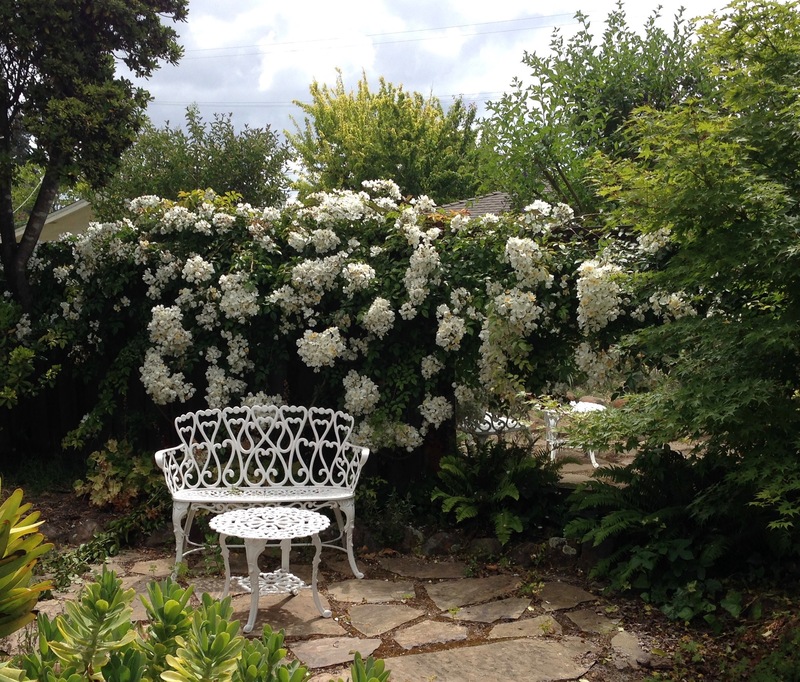 You can see a fine collection of eighty old garden roses and shrub roses at the Santa Cruz Baroque Festival’s “Music in the Garden” fundraiser on Sunday, May 22nd. This exceptional event offers opportunities to enjoy a majestic private garden in Soquel and performances by harpist Jesse Autumn (shown) and Anak Swarasanti’s Gamelan orchestra, and to support the ongoing contributions of the Baroque Festival. For information, visit the website of the Santa Cruz Baroque Festival. Recent sessions of not-really-much rainfall have greened our gardens and, inevitably, inspired weeds to grow. If you are not already familiar with the “weed bank,” you must recognize that most garden soil has a hidden store of weed seeds waiting for the right conditions to germinate. Those weeds seeds do not demand a lot, just sun and moisture. The rains provide the moisture, but the seeds must be close to the surface to gain access to sunlight. This condition can be met easily when weeds drop their seeds, winds transport them from faraway places, or birds drop them while fertilizing the Earth. Some weed seeds are well below the surface, having been buried by soil tilling or erosion. They can survive long periods (the longevity varies with the species) until they are unearthed one way or another. That’s one justification for “no-till” gardening, by the way. Evidently, my garden had a shallow weed bank, because the rains brought an abundance of vigorous weeds in every area of the landscape. Long-term prevention of weed problems always begins with mulch. A layer of three or four inches of organic material serves shields sunlight from promoting the growth of weed seeds. Another approach is the use of a pre-emergent herbicide based on corn gluten, which is a pelletized byproduct of the corn milling process. As a seed first germinates, it depends on nutrients stored in the seed, but as it grows it must develop roots to draw additional nutrients from the soil. Corn gluten is a natural, non-toxic material that suppresses a plant’s root development. It is most effective at the earliest stages of plant growth and has minimal effect on established plants. Corn gluten treats all seeds the same, so it should not be applied when planting seeds of plants that you grow purposefully. The downsides of corn gluten are that it is only about 50% effective when applied correctly. It requires repeat application whenever weeds begin to sprout. Another downside is that when wet it will smell pretty awful for a while. One gardener friend who used this weed preventer suspected she had a dead body somewhere in the garden. Also, corn gluten is rather expensive, close to $2.00/pound, perhaps because of low demand. Finally, because most corn crops use Roundup for weed management, corn gluten almost certainly contains a residue of glyphosate, the active ingredient of this chemical herbicide. After best efforts with mulching or pre-emergent treatment, and weeds are still growing, the traditional advice has been to pull them out by the roots. That seems gratifyingly thorough, but more recent advice is to cut weeds down, leave their roots to decay in the ground, and use their tops for mulch or compost. That approach is sound, but only if done before the weeds produce seeds. There are also some weeds. Such as dandelions, that will regenerate from their roots. One more thought: some plants that appear unexpectedly and in unwanted places in the garden, are garden-worthy plants that could be called “volunteers” or “self-seeders” rather than “weeds.” Examples include Italian lords-and-ladies (Arum italicum), various poppies (Papaver spp.) and the California Poppy (Eschscholzia californica), our state flower. One attractive, not aggressive volunteer is the Hawkweed (Hieracium sp. ), which I actually bought at the San Francisco Botanical Garden. This is a dandelion lookalike, with flowers very similar to the dandelion, but with unusual spotted leaves. As we await El Niño rains, the Monterey Bay area’s familiar rainy season is already late in starting, and we feel the pull of long-term perspectives on gardening. Let’s consider landscaping with succulents plants, which are gaining appeal for their interesting foliage forms and colors, ease of cultivation and propagation and of course drought tolerance. Many succulent plants can hold their own in the garden as specimens or aesthetic statements, but when we group several plants, they relate to one another in various ways and we have a landscape, either by design or by chance. Landscaping by chance is often popular, but with a little planning, gardeners can succeed with more deliberate methods. Designing with plants involves individual preferences and styles, which we always respect. There are, however, a few broad guidelines to consider. The first of these is “taller plants in back,” which is about visibility. Take the time to learn the mature height of each plant. Here is information sheet from succulent expert Debra Lee Baldwin, listing popular succulent plants by height: Instant Gardens. Another organizing guideline is to group plants by their watering needs. This technique, called hydrozoning, works with nature (always a good idea!) and makes garden maintenance easier. Using this technique requires knowing the watering needs of the succulent plants in your landscape. All succulent plants need some water, particularly during their growth periods. They need much less during dormancy. The two broad categories of succulent plants are the “winter dormant,” i.e., plants that grow during the spring and summer, and the “summer dormant,” i.e., those that grow mostly during the fall through early spring. Here is a link to winter dormant and summer dormant succulent plants. The landscape designer also could group plants by county of origin. Such grouping is a step toward creating plant communities, which are combinations of plants that are found in natural settings. Such combinations reflect the plants’ common needs for soil, exposure, climate and other factors. Gardening in this way involves detailed cultivation methods. Grouping plants by country of origin is relatively easy, while respecting nature and developing an interesting landscape. The avid gardener can discover a plant’s country of origin from some books and plant labels, or by entering the plant’s botanical name in wikipedia.org. Finally, consider combining succulent plants with grasses, which are another category of drought-tolerant plants. Grasses typically respond to severely dry conditions by going dormant, rather than by storing moisture, and grass-succulent combinations are seen in natural settings. The benefit of combining succulents and grasses is primarily in the aesthetic effect of contrasting the succulent’s fleshiness with the grass’s wispiness. To learn more about grasses, see the book, The American Meadow Garden (2009), by John Greenlee and Saxon Holt. For more comprehensive guidance, Debra Lee Baldwin’s book, Designing with Succulents (2007), provides inspiring ideas for planning your own succulent garden area. Preparing for long-term water shortages certainly includes defensive strategies, but your preparations can include landscaping with succulents as an absorbing and creative exercise. Our interactions with other persons or things can be among our most absorbing, challenging, satisfying—and occasionally most frustrating—activities. Examples include raising a child, working with colleagues, living with a spouse, cooking, and, yes, gardening. Early uses of the term, “interaction,” dating from 1832, emphasize reciprocal action, i.e., the action or influence of persons or things on each other. In this digital age, “interaction” often refers to the responses of computer software to a human operator’s inputs, e.g., keyboard entries, voice commands, or other forms of messaging. True human–computer interactions include the human’s responses to the computer’s output. In this column, we are focused on gardening. Interactive gardening means a gardener’s actions on a plant, the plant’s responses to those actions, and the influence of the plant’s responses on the gardener’s future actions. Some gardener’s believe they can influence plant growth by talking to, or playing music to, the plant, but plant scientists tell us that while plants are very sensitive to their environment, they are unaware of their gardeners or sounds. For a scientist’s analysis of the ways in which plants experience the world, read What a Plant Knows: A Field Guide to the Senses, by Daniel Chamovitz (Scientific American, 2012). The author reviews the research into what plants see, smell, feel, hear and remember, and how they know where they are. For this reason, interactive gardening involves the gardener managing the plant’s environment, the plant responding to the environmental conditions, and the gardener noting the plant’s response and modifying his or her actions to achieve an intended response by the plant. The gardener can affect all aspects of the plant’s environment, including the amount of light, heat, wind and moisture; the structure of the soil; the availability of natural or synthetic nutrients; and the presence of pests and diseases. Planting a seed involves modifying its environment. The gardener also can interact directly with a plant, but only by touching or cutting the plant by pruning, dividing or transplanting. For example, the Sensitive Plant (Mimosa pudica) responds to even a light touch by causing its leaves to fold or droop. This unusual response could be a defense against herbivores or insects that might be startled by the plant’s sudden movement. As an aside, landscaping and flower arranging do not qualify as interactive gardening because the landscaper or arranger seeks to encourage responses from other humans, not from the plants. When we consider gardening as an interaction between the gardener and the plant, we realize that the gardener’s success grows with his or her understanding of the plant’s responses to environmental conditions. This encompasses simple responses, e.g., drooping from lack of moisture, less obvious responses, e.g., slow growth from lack of soil nutrients, and more complex responses, e.g., failure to set fruit from lack of seasonal chill. Mastering the responses of plants to numerous environmental variables, and differences between plants from various native habitats, can be a lifelong study. Still, every gardener doesn’t need to study all plant’s cultivation preferences, or complete advanced studies of plant science. The gardener who wants to succeed and enjoy the experience should, however, learn about the needs of each plant in his or her garden.